ALL MAKES AND MODELS OF VACUUMS, CARPET CLEANERS, PRESSURE WASHERS AND CLEANING MACHINES SERVICED AND REPAIRED. Over time all machines lose efficiency and performance, a good service can in most cases sort this out and have it working up to scratch again. Drop your machine in with us for a no obligation quote. Even if you suspect the motor has failed it is usually much cheaper to get your current machine fitted with a new motor than buying a new machine. 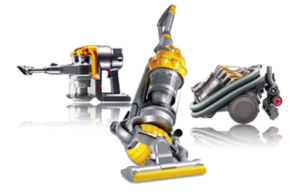 DYSON: Wakefield Floorcare are a Dyson Approved Dealer which means we are able to offer an expert Repair Service throughout Wakefield and West Yorkshire being close to Dewsbury, Leeds, Castleford, Pontefract, South Yorkshire and Barnsley. We offer a no obligation free estimate service on your machine so you know what the problem is and how much it would cost before deciding wether to go ahead . We are able to correct many common Dyson faults and offer a fast and efficient Dyson Repair Service – often repairing your machine on a ‘next day’ basis. A new motor fitted & fully serviced is usually £85.00 incl. Parts, Labour & VAT and is Guaranteed for 12 months ! If your Dyson vacuum machine has developed a problem, needs a repair, or just a general service to return to ‘as new condition’ – don’t hesitate to give us a call on 01924 375549 or bring the machine to our shop at 7 Westgate End, Wakefield, WF2 9RG where we will be more than happy to help diagnose the problem and repair it for you.